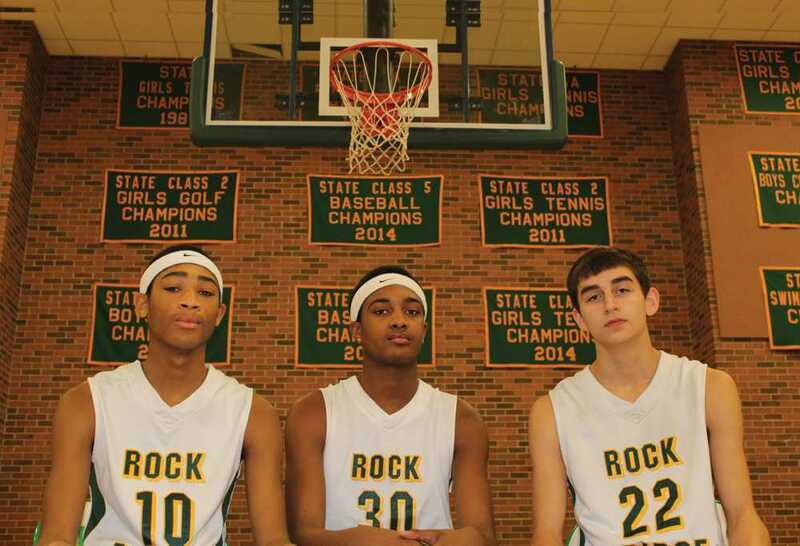 Freshmen guards (from left) Dajuan Harris, Isiaih Mosley and Ben Cooper have supplied a jolt of youth into a talented RBHS basketball team in their first season, showcasing their knack for scoring and ability to play at a high level despite their age. Freshmen Ben Cooper, Dajuan Harris and Isiaih Mosley entered the doors of RBHS on the morning of Nov. 2, 2015, nervous of what the ensuing hours would bring them. Countless days of hard work and preparation had led them to this quiet morning. The athletes were unsure of the final outcome they would receive when they set foot in the Auxiliary Gym, ready for their first high school basketball tryout. After undertaking a series of shooting, passing and teamwork drills in the tryout sessions, which included bigger, stronger and better players, they still left achieving the dream of several fellow freshmen: a spot on the RBHS varsity boys’ basketball team’s lineup. Ever since, the trio hasn’t failed to exceed expectations for competing in the toughest level of high school basketball. Effectively striking their competition with powerful offensive weapons and boasting several games with double-figure scoring, the three freshmen guards have managed to carve vital roles in RBHS’s stacked lineup despite their youth. “I’ve always noticed their passion for the game and desire to be good,” head coach Jim Scanlon said. The three freshmen have also displayed a rare on-court connection, a trait usually not present in younger players. This is attributed to their thorough experience playing with each other, which goes as far back as elementary school. Harris claims that the three of them are like brothers. Harris, a 6-foot-1 guard, agrees, pointing out that not only did past coaches help develop their connection, but also their longstanding friendship. Much of their experience in organized basketball, however, roots from Mokan Elite, a renowned youth basketball organization based in Kansas City, Mo. The trio participated together in the league’s Amateur Athletic Union (AAU) teams prior to entering high school, providing them a valuable development of skill and experience which has translated into their current play. While Cooper, Harris and Mosley have all displayed an outstanding ability to play the game in the uppermost echelon of high school basketball, competing at the varsity level has posed some temporary challenges. Playing against highly skilled opponents who in many cases are much more physically dominant is likely one of the toughest aspects of varsity, Cooper said. Despite the disadvantages they face as freshmen, Cooper is very optimistic that they will soon overcome such hindrances and establish their dominance in the sport. Like fellow freshman Harris, Mosley hopes to help bring home RBHS’s first state championship. While acknowledging that he has room to improve, winning a MSHAA State Championship would cement them as giants in the lore of Bruin basketball. Their first shot at the trophy will hopefully begin Feb. 29 at Smith-Cotton High School, which will be one of several competitive games on the path to the championship. With the departure of the team’s four highly skilled seniors in Trey Smith, Karson Ringdahl, Carson England and Tre Williams set after this season, the roles of the three talented Bruins will increase heavily in the coming seasons. Despite this eventual responsibility each will need to carry, Scanlon is confident that the next few years will be of great success and triumph for RBHS basketball. This story was very intriguing, and the quotes from the guys were helpful. It gave solid background on their past, and what kind of basketball experiences they’ve had. It’s really cool to see that they’re already talented enough to be getting varsity minutes.